Toronto, Ontario--(Newsfile Corp. - January 11, 2016) - Royal Road Minerals Limited (TSXV: RYR) ("Royal Road Minerals" or the "Company"), a gold focused mineral exploration and development company, is pleased to announce results from the first eleven saw-cut channel samples from underground workings at the La Golondrina gold mine in Colombia. La Golondrina is a currently small-scale underground gold mining operation located in the La Llanada gold mining district of Nariño province in southern Colombia. 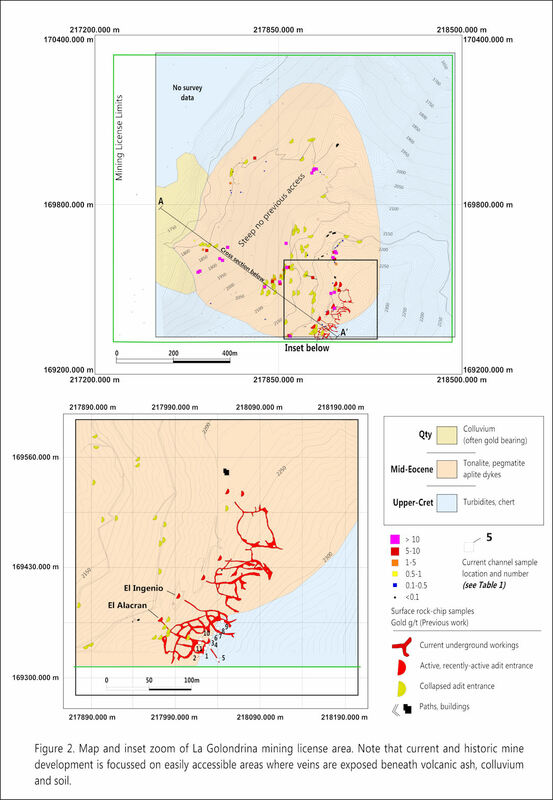 La Golondrina comprises multiple levels of horizontal underground mine development which have accessed surface exposures of dominantly shallow-dipping high-grade quartz-veins (see Figure 1) and vein zones over a known vertical extent of 400 meters and over an aerial extent of approximately 600 by 800 meters (see Figures 2 and 3). 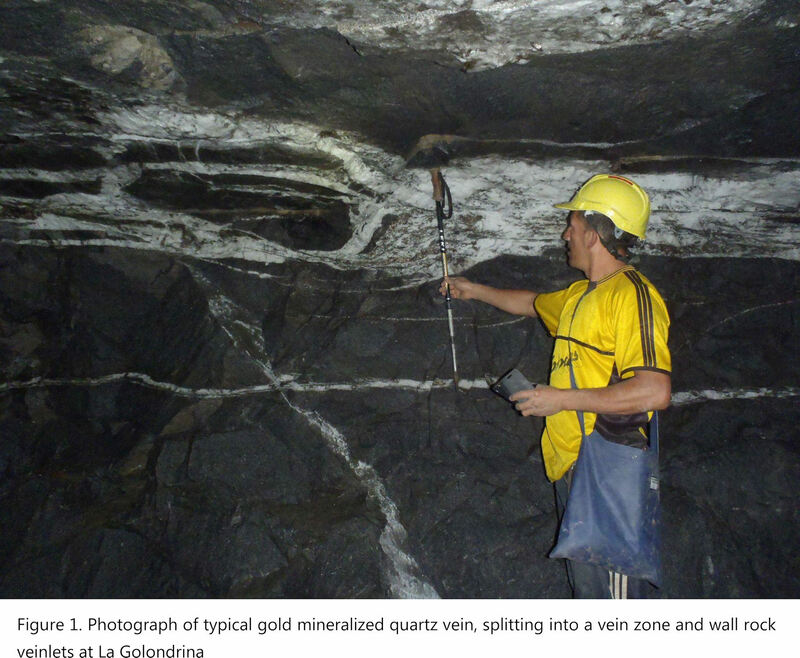 Mining at La Golondrina commenced during the early 1980's and has been focused only on those quartz veins that are accessible and exposed (see Figure 2). Much of the La Golondrina license area is concealed under recent volcanic ash, colluvium and soil. In 2011 AngloGold Ashanti conducted geological mapping, rock-chip sampling, IP-geophysics and ground magnetics over the project area. Mineralization at La Golondrina is part of an Eocene age intrusion-related gold system hosted in a Cretaceous age metasomatized (hornfels) marine sedimentary sequence. The Company has an option to earn a 100% undivided interest in the project under the terms outlined below (see Press Release October 7th 2015). There has been no drilling conducted at La Golondrina. Management of the Company believes that there is an opportunity to define a significant high-grade plus million ounce resource at the project and to rationalize, modernize and expand the current operations. The Company is currently conducting saw-cut channel sampling on two active underground mining levels at La Golondrina. 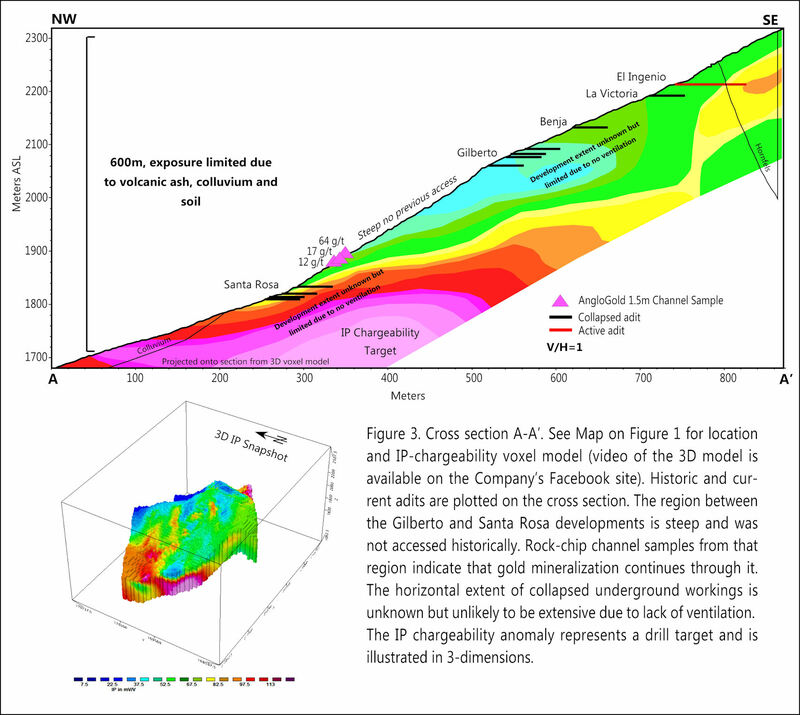 The aim of this sampling is to confirm the high-grade nature of vein-hosted gold mineralization and to test vein zones and vein stockwork zones in the host-rock outside of and adjacent to the main vein bodies. The results from the first eleven saw-cut channel samples from the El Alacran and El Ingenio adits (See Figures 2 and 3) have now been returned (see Table 1). Underground quartz vein samples returned an average of 41.5 g/t gold over 0.3 meters with the best result being 106.5 g/t gold over 0.7 meters and gold mineralized veinlet stockwork zones hosted in hornfels have returned up to 41.8 g/t gold over 1 meter. Wall rock material including hornfels has been to shown to carry gold mineralization where it is penetrated by quartz veins and veinlets or is silicified. Metallic screen analyses reveal that on average 94% of gold reports to the plus 150# (>.125mm) size fraction. Dr. Tim Coughlin, President and Chief Executive Officer of the Company, stated "This is an encouraging first batch of sample results which confirms the high-grade nature of quartz vein hosted gold mineralization at La Golondrina, proves that gold mineralization there extends beyond the boundaries of the intrusive host-rock into adjacent hornfels and shows that gold is generally coarse and thus probably amenable to commercial-scale recovery by gravimetric methods. Further saw-cut channel sampling is underway from active underground development and we are trying to access some of the older workings. Once complete, the analytical results from these channel samples will be very useful for resource calculations and for statistical analysis of drill results which can prove problematic for high-grade gold mineralization. Our key question as far as the vein-style gold mineralization at La Golondrina is; what is the lateral extent and stack density, or vertical frequency of quartz veining? Mapping work shows that veins, where accessible and exposed, extend over a total vertical interval of at-least 400 meters but only drilling will reveal the answer to their lateral extent and stack density. As far as bulk tonnage targets go, it is very encouraging to see that gold mineralization extends into the adjacent hornfels as the heterogeneous physical and chemical nature of this rock may hide some favourable host settings that can only be revealed by geophysics. We are currently working through IP-geophysical and ground magnetic data which has already revealed some interesting possible bulk tonnage targets considered worthy of drill testing." The Company has the option to acquire a 100% undivided interest in the La Golondrina project. carry out the following exploration work on the La Golondrina project on or before the third anniversary of the effective date of the Option Agreement: complete detailed surveying and sampling of the mine site and surrounding veins to plan drill holes; complete a detailed review of the induced polarization (IP) survey and ground magnetic survey; and carry out a minimum of 1,500 meters of drilling. After making these payments and completing this exploration work, the Company may, prior to the third anniversary of the effective date of the Option Agreement, give a notice to the Optionors of its intention to complete a feasibility study. If, after completing the feasibility study, the Company determines that the development of a mine is justified at such time, the Company may exercise the option and, thereupon, it will acquire a 100% interest in the La Golondrina project (subject to the royalty described below), the Optionors shall cease all mining operations at the La Golondrina project, and the Company shall pay the Optionors an aggregate of US $100,000 per annum until the Company commences commercial production. In the alternative, the Company may, at such time, elect to defer making a production decision and exercising its option for up to three years, and instead pay to the Optionors the aggregate sum of US $20,000 per annum during such deferral period. Upon any exercise by the Company of the option, the Optionors will have the right to elect to receive either: (i) a 20% net profit royalty to be paid once payback of all capital invested to expand and construct the operation has been made; or (ii) a 15% net profit royalty, to be paid once payback of all capital invested to expand and construct the operation has been made, plus a 1% net smelter royalty. This news release may contain certain information that constitutes forward-looking statements. Forward-looking statements are frequently characterized by words such as "plan," "expect," "project," "intend," "believe," "anticipate" and other similar words, or statements that certain events or conditions "may" or "will" occur and include statements regarding the Option Agreement. Forward-looking statements are based on the opinions and estimates of management at the date the statements are made, and are subject to a variety of risks and uncertainties and other factors that could cause actual events or results to differ materially from those projected in the forward-looking statements. These factors include the inherent risks involved in the hiring and retention of directors and officers, exploration and development of mineral properties, mine site planning and development, the uncertainties involved in interpreting drilling results and other geological data, fluctuating metal prices, permitting and licensing and other factors described above and in the Company's most recent annual information form under the heading "Risk Factors", which has been filed electronically by means of the Canadian Securities Administrators' website located at www.sedar.com. The Company disclaims any obligation to update or revise any forward-looking statements if circumstances or management's estimates or opinions should change. The reader is cautioned not to place undue reliance on forward-looking statements.